CHICAGO -- A video recorded as a powerful storm ripped through the Chicago area over the weekend is going viral. 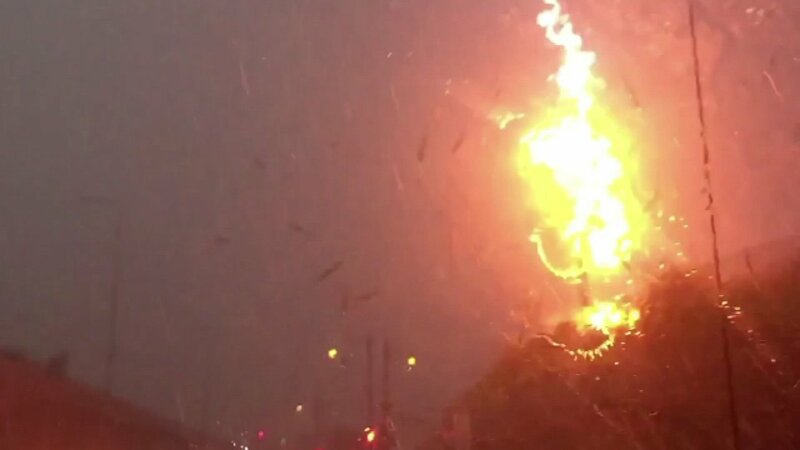 A driver said she captured video Sunday night of a lightning bolt hitting a telephone pole near I-90 and Irving Park Road in Chicago. That pole exploded, sending debris flying. An aluminum canopy covering a pedestrian walkway was knocked onto the CTA Blue Line tracks at the Illinois Medical District station during the storm. Two sisters driving along I-290 took cell phone video of the dramatic flashes near the Illinois Medical District stop just before the canopy fell. Thankfully, no one was hurt. Investigators are looking into what happened. The thunderstorm brought high winds and heavy rain, forced Coldplay fans to take cover at Soldier Field and canceled the New Edition concert at UIC Pavilion due to flooding.